Fresh off the Oskar Blues web site comes news that their brand new Longmont restaurant will open next week. This looks to be a great new spot to sample not only Oskar Blues brews and music but also many other fine craft beers on tap. Their new menu should be online soon at the Oskar Blues web site. Oskar Blues Home Made Liquids & Solids opens its arms to Longmont this Monday, October 12th with a toast to the local businesses that helped create our newest beer blessed home. Our down home beer joint celebrates beer culture with 43 craft taps, Southern inspired BBQ & soul saving Live Music. An in-house smoker, the Midnight Toker, stoked with local apple wood will turn out slow smoked North Carolina style BBQ Pork, Spare Ribs, Beer-Can Chicken, Salmon and Turkey. The Zero Waste kitchen will also feature Gluten Free & Vegetarian inspired dishes served next to Oskar Blues favorites like the Silo Burger. Update: If you want a sneak peak at the new restaurant then plan to attend this year's OSKTOBERFEST. Oskar Blues is hosting their annual Osktoberfest party from 2:00pm to 5:00pm Saturday, October 10th. The event will happen at both the Oskar Blues brewpub in Lyons and their new restaurant in Longmont, Home Made Liquids & Solids. Live music, bobbing for apples, and a giant pumpkin raffle. Brats, burgers, caramel apples, and a whole pig roasted in their new smoker. Plus all that good O.B. brew. - Oskar Blues debuts new tasting room Tasty Weasel. 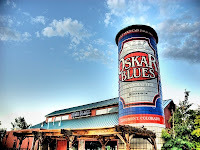 - The breweries of Longmont part III - Oskar Blues.